I was recently asked to review a kid’s activity craft called “Powder Art”. I finally got the chance to do it with my 2 children (ages 3 1/2 & 5). I often reward them with fun things like this because they really enjoy being creative. When I opened the box, the first thing that I noticed was how neat and organized everything was. Each powder color had it’s own little ziploc bag and it also came with a plastic container with sections to pour the powder colors into so it would be easier to work with. The concept of Powder Art is really neat! 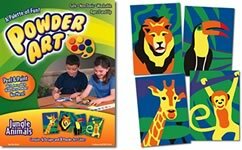 Instead of painting with liquid paint, children “paint by number” with a brush dipped into a very fine colored powder. And the powder is made from recycled materials! How cool is that? Powder Art is available is six different designs: Bible stories, Magical moments, Jungle animals, Puppies and kittens, Planes & Trains, and Sports. Each box retails for around $9.99. Check out my video where I show you exactly what comes in the Powder Art box and the directions on how to use it. So, what do you think? Fun right? The only warning I have for you, is to make sure you cover the table that you will be working on because the powder gets everywhere. I am sure it is because my kids are still young yet, so they tend to be messy. But I put newspaper down and when we were finished with the project, all I did was pull up the newspaper from the edges into the middle and the powder stayed put and then into the garbage. Some powder got on the floor, but it was surprisingly easy to clean up. It didn’t stain at all. It washed right up with a sponge. Be sure to check out my current Jewelry Giveaway. All you have to do is comment to enter! The jewelry is so nice too! Click Here.